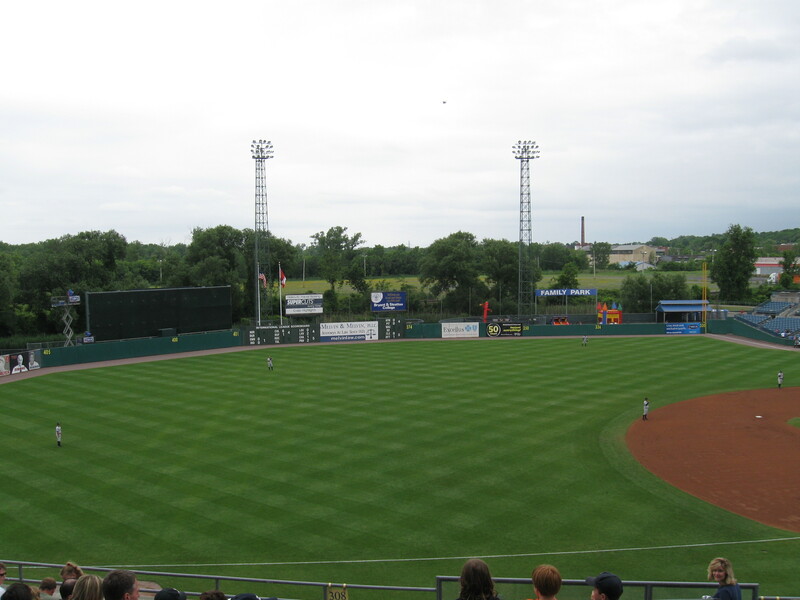 Over the weekend, I was back in Upstate New York for a wedding and on our way back home, we stopped at Alliance Bank Stadium in Syracuse, NY for an International League game between the Chiefs and Scranton/Wilkes-Barre. It has been nine years since my last visit here and a lot has changed as Syracuse dropped the “Sky” preceding the Chiefs nickname and the corporate sponsor switched from P&C Foods to Alliance Bank. I know it was built at the site of their old ballpark, MacArthur Stadium, but the location of the ballpark still bugs me as it is quite blah in North Syracuse. The only thing nearby is the huge shopping mall known as Carousel Center and that has become a sore and frustrating subject for many in the region as the long-promised Destiny USA has seen construction stop. The project was supposed to make the mall one of the biggest in the country and a tourist destination, but now what was a fine shopping mall, is now an eyesore. Anyway, I still enjoy the exterior and interior of this ballpark, though it’s a shame the outfield view isn’t great. 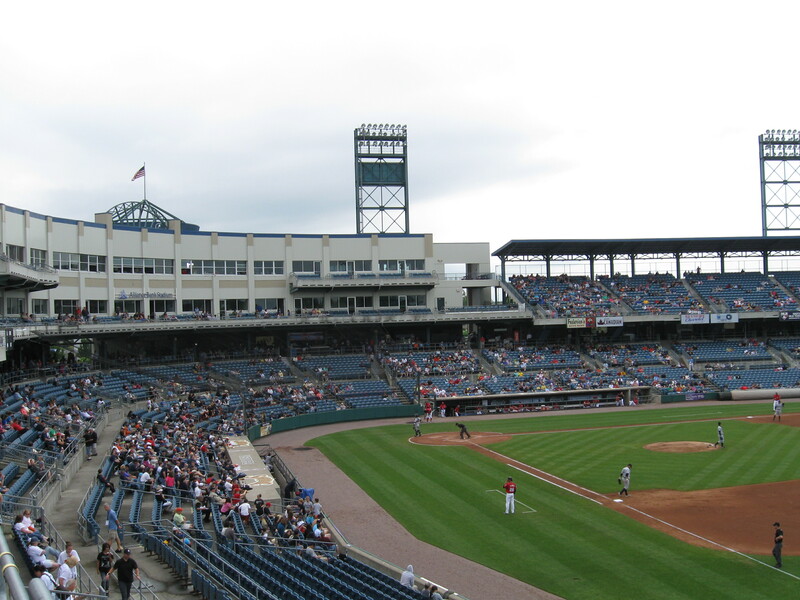 In it’s design, Alliance Bank Stadium is nearly identical to Harbor Park in Norfolk, which I just saw a few weeks ago. A couple great things here that the franchise did. First, the artificial turf is gone! I was also very happy to see a decorated outfield wall, complete with banners for pennants and Governors Cups. Also on the wall are the faces of retired #9 Hank Sauer, Owner Tex Simone and Jackie Robinson. Food-wise, you can never go wrong with the $3 salt potatoes that are a specialty in the area. We saw a pretty good game here in front of a crowd that was a bit thin, but more than what we saw in Norfolk. Announced attendance was 6,247. Ryan Zimmerman was on assignment for Syracuse and he didn’t look that great going 0 for 5 and having a poor throw in the field. I saw my first ever over-the-wall catch as Scranton’s Dan Brewer robbed Jesus Valdez of a home run. The score was 1-1 until the 7th, when Yankees reliever Josh Schmidt threw poorly to first on a soft grounder and it ended being a three base error as Chris McConnell (already on first) came all the way around to score. The Yankees though then took the lead by scoring four in the 8th. Syracuse had some fight as they cut the lead to 5-4 in the bottom of the ninth and had runners on first and second, but Randy Flores got the last two outs. Overall, a great game and a terrific afternoon in Syracuse at Alliance Bank Stadium. It was great to be back and the rankings were tweaked to reflect the re-visit. The addition of the outfield wall banners helped boost the ballpark up a few points. I would recommend they improve the “Alliance Bank Stadium” signs both on the outside and in, they still look temporary like they were hastily put up after the name change. Despite the copying of Norfolk, it is a fine venue and place to check out a game. Click here to read the re-review and also head on over to Stadium Journey where I’ll be doing an official review soon.